During a recent week at the Goldberg Clinic we saw five new patients taking Biological Drugs, a relatively new class of pharmaceutical agents sold under the brand names Remicade, Humira and Enbrel. These drugs, once prescribed as a last resort for those suffering with severe autoimmune disorders, are now being promoted more aggressively by drug companies and Physicians. In many cases, biological drugs are now employed as an initial course of treatment for both children and adults, a trend we have witnessed at our clinic and one that raises much cause for concern. Biological Drugs are most commonly prescribed by Rheumatologists and Gastroenterologists for numerous conditions including Rheumatoid Arthritis, Psoriasis, Multiple Sclerosis, Ankylosing Spondylitis, Crohn’s Disease, Ulcerative Colitis and other chronic health disorders. The drugs interfere with a key portion of the immune system, Tumor Necrosis Factor Alpha, a cytokine involved in the inflammatory process and in the protection against cancer. The immune suppressing action of TNF-alpha blocking drugs is in some cases effective in providing patients with temporary symptomatic relief, but at what cost? The multiple adverse effects associated with TNF-alpha inhibition have been well identified through clinical trials and post market surveillance. Many are associated with the immune suppressing action of the drugs which interferes in the body’s ability to fight infection and protect itself against cancer. 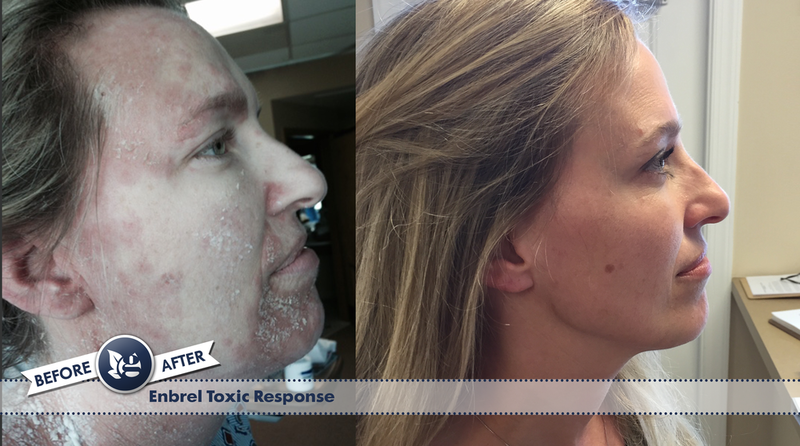 Heather (see pictures to the right) came to the Goldberg Clinic in June 2015 after having suffered a severe allergic reaction to Enbrel, a biological drug prescribed for her Rheumatoid Arthritis. 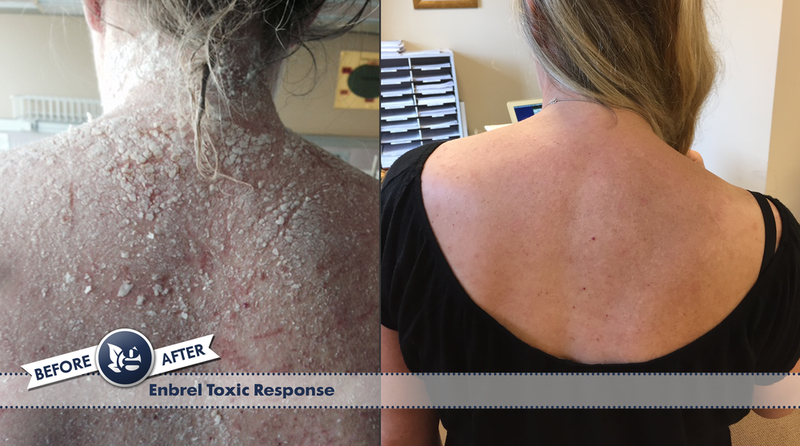 Following injections, she saw swelling and redness around the injection site which then gradually progressed into a severe full body rash. Heather was hospitalized and prescribed Prednisone to suppress the allergic response. The nurse informed her that she had experienced a toxic reaction to Enbrel. During their years on the market, many of the biological drugs have had their share of controversy amidst a growing list of black box warnings issued by the FDA. Despite growing concerns, the use of biological drugs for the treatment of many autoimmune disorders is becoming more and more frequent. Biological drugs first came on the market in 1998 and since that time we’ve seen many patients at the Goldberg Clinic who have taken them as part of their medical history. In most cases, the symptomatic relief afforded by the drugs is temporary at best with many patients reporting a return of symptoms anywhere from 6 months to a year later. We’ve seen the adverse effects of biological drugs first hand…cancer, allergic reactions, neurological symptoms etc, leaving the patient not only with their original condition but also with a list of new challenges that have come as a result of drug treatment. The following case from the Goldberg Clinic is an example of this all too common scenario. Grace shares her experience having taken Remicaide, a biological drug. During one of her infusions, she had an allergic reaction that caused her to break out in hives. Grace Vise, patient at the Goldberg Clinic. Anderson and Steve (see videos below) came to the Goldberg Clinic after having refused treatment with Biological drugs due to concerns over potential side effects. Both Anderson and Steve recovered their health under our care and are now drug free. Anderson was diagnosed with Juvenile Rheumatoid Arthritis at the age of two. He had been on multiple drugs including NSAID's and steroids for many years. His Rheumatologist recommended putting him on weekly injections of Enbrel, a biological drug, which his parents refused. Anderson is now healthy and drug free. Steve Husk was diagnosed medically with Ankylosing Spondylitis, an inflammatory autoimmune disorder that causes significant pain in the joints and progressive physical disability. His Rheumatologist recommended he take Humira. "They wanted to put me on a medicine that can cause lymphoma. That just didn't seem like a good idea to me. So I came to the Goldberg Clinic instead to find out what was causing my health problems." Steve Husk, patient at the Goldberg Clinic. The increasing use of biological drugs for patients with autoimmune disorders is a risky proposition and one that ignores the fundamental reasons why patients are ill. At the Goldberg Clinic, our patients know that we are interested in renewing their health and vitality, not the mere suppression of symptoms that often results in further disease complications. We must identify and remove the causes of health impairment and address those factors specifically if patients are to ultimately recover their health and avoid the hazards of drug treatments. The Goldberg Clinic is here to assist those ready to build health rather than treat disease and has done so successfully for thousands of patients over the past 40 years. Read Part II of this article: "There is No Free Lunch" by Dr. Paul Goldberg.